Balmy days ahead mean it’s almost time to drag the barbecue out of the shed and get ready for some warm weather grillin’. 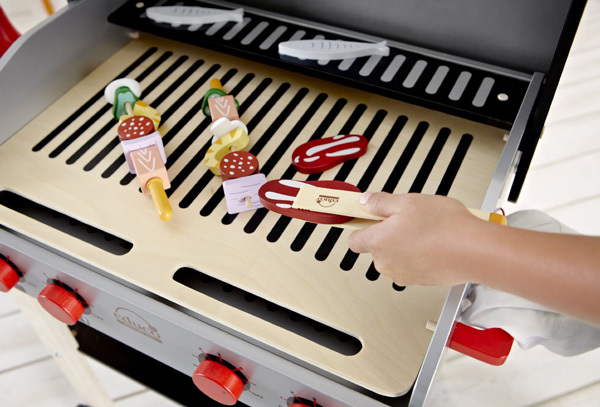 Let the kids do some backyard grilling of their own with this sweet wooden barbecue toy from Educo. 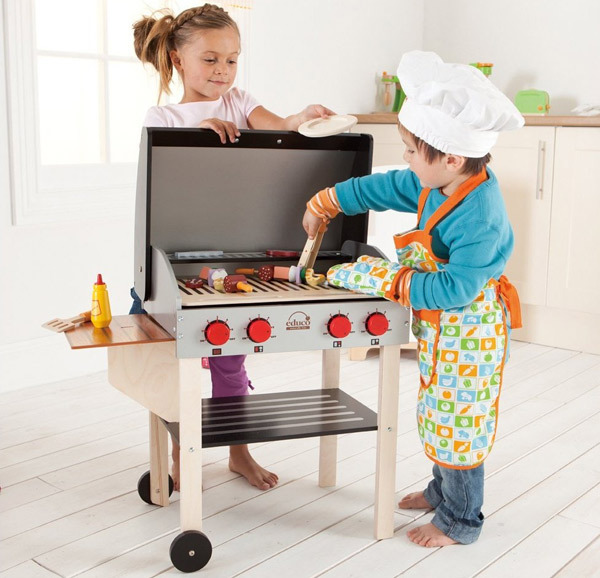 Made from wood, the My Backyard BBQ is a perfectly pint-sized and rather sturdy replica of the real thing, right down to the keep-warm rack, collapsible side table, “hot” glowing coals under the grill plate and the open-and-shut hood. Little chefs will have hours of fun on the back verandah this summer and, if you’re lucky, it may even encourage them to be a bit more adventurous in their own food choices. You’ll find the My Backyard BBQ on Fishpond for $179, with free shipping. 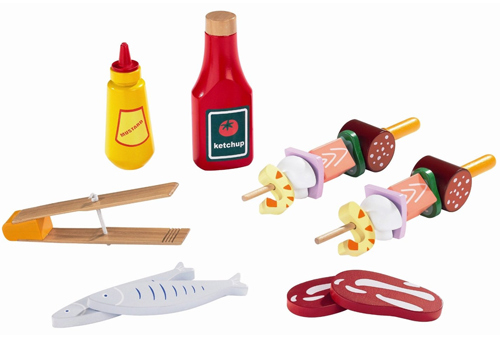 Of course, a proper Aussie barbecue wouldn’t be the same with the ubiquitous bottle of sauce, and you’ll find one in Educo’s matching backyard barbecue food set. It also contains everything else needed for hosting a slap-bang cookout, including fish, prawns and build-your-own kebabs. There’s tongs and mustard too, all for $62 from Fishpond. To make things really healthy at your pretend barbecue feast, you might like to toss in a garden salad, like this toy lovely below with its felt leaves alongside slices of capsicum, tomato, cucumber, carrot and onion. A bowl, salad servers and dressings are included. 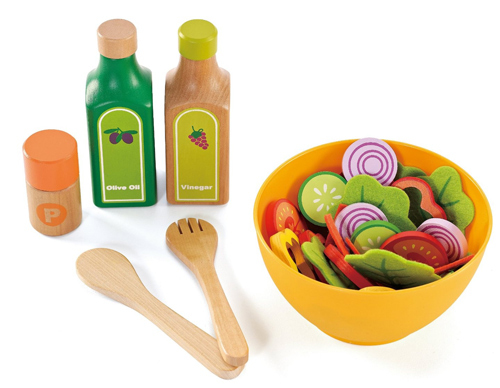 The Educo Healthy Salad playset is $34.95, plus $7.95 delivery, at Send a Toy. We have this one at home and my kids often throw in some wooden sugar cubes to act as feta. How healthy is that! 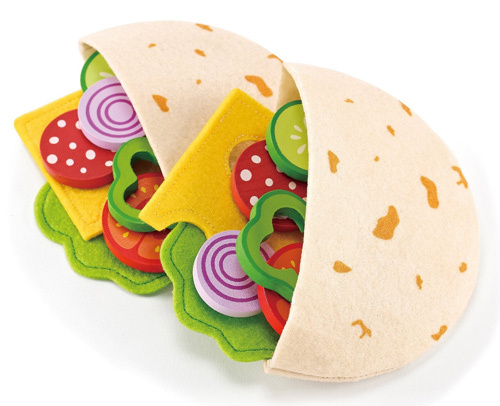 Educo also make a terribly cute pita bread set that allows toddlers to create their own healthy pita sandwich, with pieces of tomato, cucumber, onion and cheese, for those days when they don’t feel like pretend meat. The Healthy Gourmet Pita Pocket Lunch set costs $27, also on Fishpond. Happy barbecuing with the kids this summer!